The University of Tokyo Hospital offers wide range of advanced medical education and training opportunities to foreign medical graduates. There are four options. 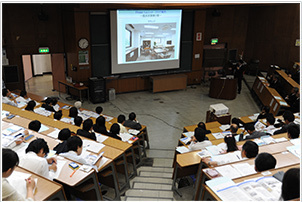 “Advanced Clinical Training” is an option accredited by the Minister of Health, Labor and Welfare under the Japanese law. Currently, one who does not hold a Japanese medical license can engage only in observation-study or training in a hospital setting without patients. However, once the foreign medical graduate has been granted permit for this program, he/she may receive clinical training which includes clinical diagnosis and treatment of patients. However, the program requires strict legal process between the Ministry of Health, Labor and Welfare and the Ministry of justice. An official certificate of program completion may be issued at the end of the program. A brief, single to a few days visit to certain in-house facilities or hospital divisions under guidance of faculty staff member will be involved in this category. No certificate will be issued. This program is in association with the Graduate School of Medicine. The objective of this option is to provide opportunities to foreign faculties to be involved in clinical or translational research projects at the University of Tokyo Hospital. Strict restrictions apply including requirement for official invitation and approval by the committee within the Graduate School of Medicine, the University of Tokyo.